We held “All Aboard! 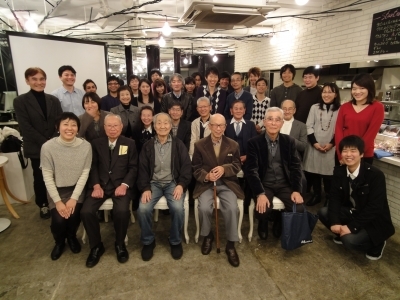 Year–End Party” last week! We would like to thank all of you who participated and who supported us this year. It was an opportunity to tell the supporters about our activity in 2012, and to deepen the relationships between the members and the supporters. It was held in Town Design Cafe in Omotesando. We would like to thank the staffs of the cafe. First, we did Quiz about the BFP! Although some people joined the event of BFP for the first time, everyone considered seriously and seemed to enjoy to think the right answer. 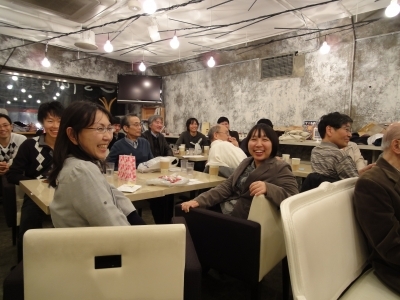 During the chatting time, each table enjoyed introducing each other. 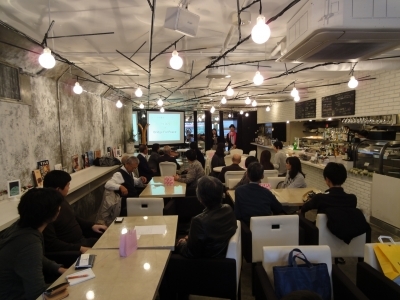 Then, representative of BFP, Naoko Jin reported the annual activity. And then, report from Natsuko Yaguchi, who put a lot of effort on BFP workshops at high schools and universities. Miki Masuda, Manager of "interviewing Japanese soldiers" team. Junichi Nakamura, Manager of korea tour, which we started this year. We showed movie of "free hugs" we did during the tour. Prof. Yoshiyuki Nagata, University of Sacred- heart, board member of BFP. He gave us a comment about the progress of BFP this year. Prof. Satoshi Nakano, Hitotsubashi Univ, board members of BFP also gave us a comment and he gave BFP calenders to the supporters who had a big contribution this year. Moderator was Natsuki Hatae, and Yuki Natsui. Thank you for reading. All the photos were taken by Megumi Tsuda. Thank you Meg! Year 2010 was the tenth anniversary of my first visit to the Philippines. Therefore, it might be appropriate to announce this year 2011 as the first steps of our new beginning. These words thrown to me by a Filipina victim of the Pacific War in this first visit prompted me to start an organization BFP, Bridge for Peace. What could I do as a Japanese? As I considered this question, I eventually came up with an answer, which was to deliver local Filipino people messages from Japanese veterans. New encounters were born through this project so that I gradually became confident of the positive energy obtained through establishing "exchanges” and “bonds"
We continued our activities of delivering messages by film shows followed by Q&A sessions both in the Philippines and Japan during the past seven years, which expanded the circle of communication. 2010 was the year in which our group gained the status of corporate body, giving a good opportunity to look back and reflect on ourselves. In addition, I was invited to present a film and to speak at an international forum in Canada, a new country for me, where I could meet with NPO members from various countries and discuss our activities with them. Welcoming advice and suggestions from friends, supporters and professionals, our organization has decided on our policy of developing projects, with Education and Workshop as leading concept. “Workshops to know the Asia Pacific War and seek hints for Future Approach."